Upcycle bottle caps and patterned card stock for this unique Christmas card! If you aren't much of a card maker, try an ornament or in a photo frame instead. 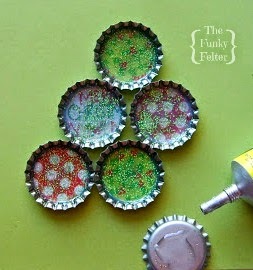 CLICK HERE for this upcycled bottle cap tree craft tutorial. Wonderful idea. Thanks for sharing!